Sandow Birk is a well-known Los Angeles artist whose provocative work deals with contemporary life, emphasizing social and political issues. His poignant and often satirical artworks have featured themes such as inner-city violence, war, graffiti and prisons. This exhibition includes works from Birk’s reinterpretation of Dante’s Divine Comedy, in which the artist transformed a centuries-old classic into a witty allegory with political relevance for today’s audiences. Birk collaborated with writer Marcus Sanders to relocate the 14th-century Italian poem in urban America. The five-year project resulted in three limited-edition books that translated the text of the entire Divine Comedy into contemporary American English slang. In the series, Birk adapts Gustave Doré’s famous 19th-century illustrations into images of 21st-century America, setting Inferno in Los Angeles, Purgatorio in San Francisco and Paradisoin New York. In the imaginary narrative, Dante is depicted as a jeans-and-hoodie-wearing character wandering city streets and architectural settings littered with fixtures of urban life and pop culture, like fast-food stands, traffic lights and billboards. Also included in this show is a selection of works from Birk’s ambitious and controversial nine-year project to create an illuminated manuscript of the entire Qur’an in English. After extensive research and travels, the artist hand-transcribed a copyright-free Quranic text according to historic Islamic traditions. Birk’s calligraphy uses a street-style lettering based on graffiti found around his Los Angeles neighborhood. 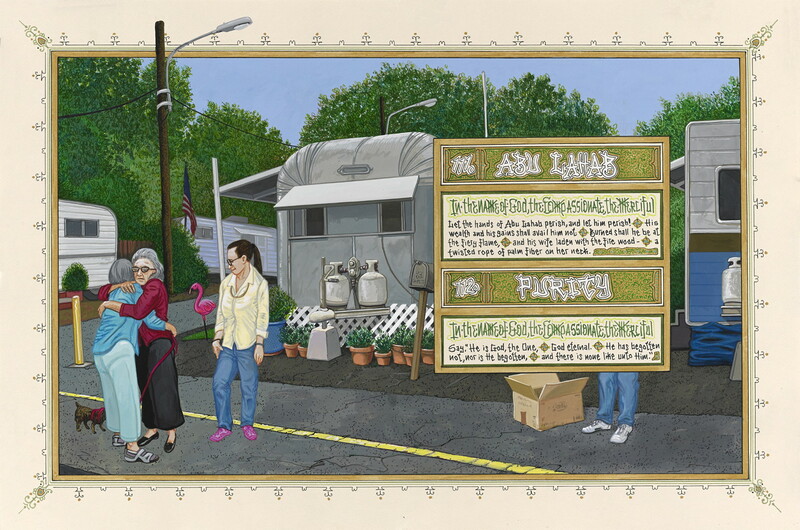 The text is illustrated with relevant scenes from contemporary American life as a backdrop. The project strives to bridge cultures through inspired open dialogue and frank conversation.